Submarines and surface fleets battle for Cold War dominance! NATO players must use their submarines to sneak troops into enemy ports, destroying vital strategic targets, while the Soviet team deploys a surface fleet to hunt down the subs and protect their crucial supply lines. 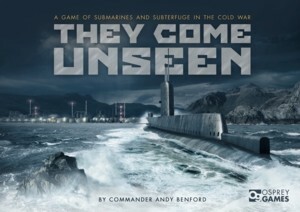 Designed by retired Royal Navy Officer and submarine commander Andy Benford, and developed deep beneath the waves, They Come Unseen is an asymmetrical strategy game of bluff and deception that uses two boards, one for action on the surface, seen by both players, and one for movement underwater, seen only by the submarine commanders. The game also comes with specially designed control panels to help keep track of vital information such as fuel, ammunition and current cruising depth.